Footworks provides thorough and attentive Chiropody, Podiatry, and Nail Treatments. We offer advice and therapy on possibly the hardest working and often most neglected, part of your body... your feet. 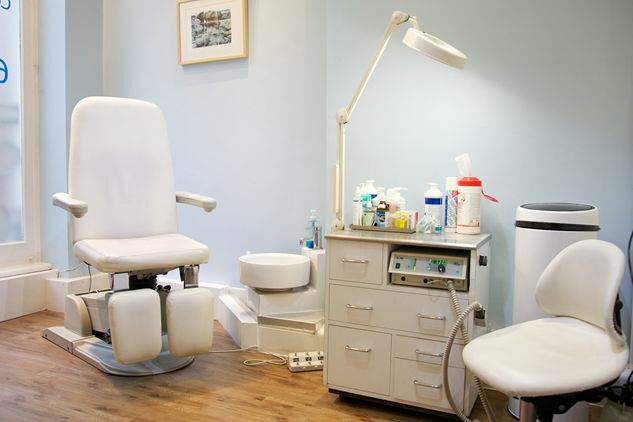 We are an independently owned, friendly clinic offering chiropody and podiatry treatment by qualified and experienced practitioners in a convenient Birmingham City Centre location. Tucked away from the crowds it is a sanctuary of peace and relaxation for both consultations and foot treatments. Our web site provides information on treatments, where to find us, tips and advice and from time to time special offers that are available only through the web site. If you fail to notify us that you are unable to attend your appointment by giving us 24 hours notice, then you will be charged in full. For all new patients, we require payment in advance, at the time of booking. If you fail to attend this initial appointment then you forfeit your pre-payment. Our chiropodists will work closely with you, carrying out a one to one consultation before recommending the most effective course of treatment for you. Many foot problems can be prevented by regular visits to a chiropodist or podiatrist, and potential painful conditions can be diagnosed and treated in the early stages avoiding unnecessary suffering. After your visit we provide you with comprehensive aftercare service, and we're happy for you to see the same chiropodist on return visits for continuity of care. AMAZING BEAUTY OFFER DURING NOVEMBER & DECEMBER!